It's been a hot one lately! WHAT THE HECK?!?! WHY?!?!?!?!?!?!? I was so utterly excited about Fall happening...and it was so very Fall like here (as much as it can be in Southern California)- rainy, grey, cold (ish), snuggly...you get the jist. But then....for some reason way unbeknownst to me...it became hot. VERY hot. Our little beach town we live in actually reached 101!!! That's hot. Especially for here. So my big plans to showcase my recipe for pumpkin pie ice cream in all its Autumn glory was quickly stomped upon by the sun. Grrrrr.... Maybe by the time some of you read this it will be Fall like! I hope so. I hope it's cold outside with threats of rain. I hope you have a fireplace burning in the background (or at least some spice scented candles) and lots of throw blankets lying around. I hope as you're reading this you're wearing some Uggs and a cozy sweater and sipping on some tea. Not sweating your face off at 7pm in a poor excuse for clothing because that's the only thing you could muster up to "wear". 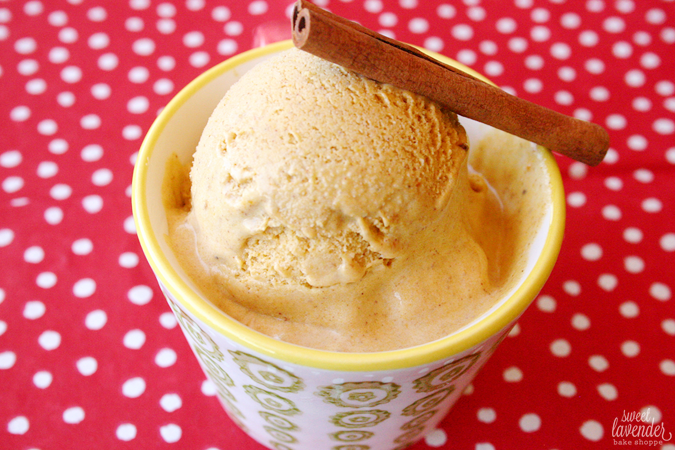 So, without further adieu, I present you with a DELICIOUS recipe for homemade Pumpkin Pie Ice Cream! Creamy and so very pumpkin...ie, with just the right amount of those spices you totally associate with a good 'ol pumpkin pie. I taste tested it on a few family and friends and each one said the same thing, "Wow...this tastes like a really good slice of pumpkin pie.." SCORE!! But they also said it with a sort of shocked face, which I found amusing. Would you expect any less from me? Come on. In this recipe, I used real organic pumpkin (and a lot of it) so you can be sure you're eating somewhat of a good thing...even if only from the real organic pumpkin. Haha. 6 oz (by weight) sugar (I used homemade vanilla bean sugar). 1. In a small saucepot add milk, vanilla extract, pumpkin pie spice, and cinnamon stick (or ground cinnamon). Bring to a gentle simmer and then remove from heat. Let sit and steep for about 5 minutes. 2. Meanwhile, weigh out your sugar and add to your yolks. Whisk together until pale and fluffy, or you've reached the "ribbon stage". To see what I mean by "ribbon stage" click here. 3. Next, make a large ice bath. Add a fine mesh sieve so that when your mixture is ready, so are you! Slowly pour the warm milk mixture into the bowl with your whipped eggs and sugar so that you're tempering the two. Then pour the whole entire mixture BACK into your saucepot and place over a medium (or even medium low) flame. 4. With a wooden spoon stir the mixture around. DO NOT stop stirring. You're looking for the mixture to coat the back of your spoon (also known as nappe` stage). This step can go very fast and you don't want to risk cooking your eggs. You'll know you're getting close when the tiny bubbles on the surface start to disappear and the mixture begins to thicken up. Or you can measure it on a candy thermometer- you're looking for 180* F.
5. Once you've reached the nappe` stage, quickly pour mixture through your sieve into your bowl which is in an ice bath. The sieve will catch any cooked egg that might have been created and any extra spices. 6. Slowly and gently stir the mixture in the ice bath until you've reached about 40*F. Once your mixture has reached desired temperature, slowly whisk in the cream and the pumpkin puree. If you want, at this stage, you can chill your mixture over night to let "ripen"- so that the flavors incorporate fully. 7. When your mixture is cooled, turn your ice cream maker on BEFORE adding. Pour in mixture. Here's where you need to follow your ice cream maker's instructions. For my Cuisinart Ice Cream Maker, this took about 25-30 minutes. You'll know you're there when you've reached a sort of soft-serve consistency and your mix has lightened up in color ever so slightly. 8. Finally, add your ice cream to a freezer-proof air tight container and freeze overnight. All I crave is ice cream!!! I so want to make this but my ice cream maker is still packed away. Sad day. :( I might have to save this for later and run to Trader Joe's for some Pumpkin Ice Cream in the mean time.